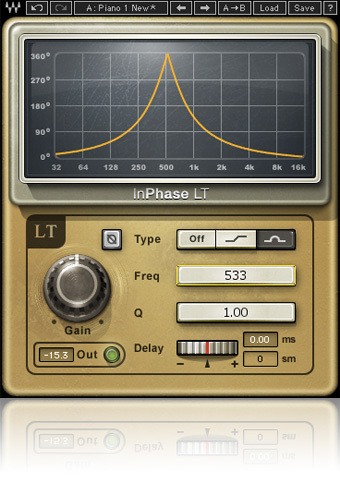 With its simplified controls, intuitive interface, and powerful phase shift filters, InPhase LT is a one-stop creative tool that makes it easy to enhance, manipulate, and accentuate your tracks. Phase Invert flips the phase by 180 degrees. 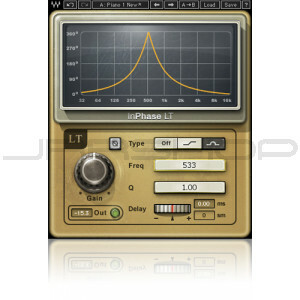 Phase Shift Curve Window displays the phase shift curve across the frequency line. Frequency selects the frequency at which the phase shift is 90° using the 1st order allpass filter, and 180° using the 2nd order allpass filter. Q sets the width of the Bell (2nd order allpass filter). Output LED displays the peak signal output level.